Looking for Advent ideas? Here’s an awesome collection of simple Advent activities. None of them require a lot of preparation or expense. Easy and simple is perfect for this busy time of year! Build memories that last a lifetime. Advent is one of my favorite seasons. It provides a quiet oasis of peace in the midst of the Christmas craziness. Advent invites us to stop and take a breath. Instead of fretting over endless lists we can slow down the season. Savor it and embrace the ritual of preparations. When my boys were still home I usually had elaborate plans for Advent, but these tended to slip past me in the hustle of busy family life. Still we always found time to enjoy some simple traditions that didn’t take a lot of time and preparation. And that worked really well for us. I have gathered together a few simple Advent activities. None of them require a lot of preparation or expense. The first Sunday of Advent is almost upon us, so easy and simple is good! Have fun. Celebrate. Enjoy the season, but don’t overwhelm your schedule. The idea is to make memories and encourage family connections, not create extra stress! Pick one or two ideas and then enjoy a simple and meaningful Advent. An Advent wreath is a tradition that comes to us from the church. If you are interested you can learn more here. Kristin Yellow Bliss Road has published some lovely photographs of very simple Advent wreath. If you prefer to use the more traditional circular shape simply use a round plate or tray. Michelle at A Mommy’s Adventure has instructions for making a hand print Advent wreath from hand prints. What a lovely way to make a family wreath that is safe for younger children to play with. Sun Hats and Wellie Boots show you how to make a traditional Advent wreath using natural materials. Advent calendars are a wonderful way to help children countdown the days of Advent. You could simply go out and buy one and there is nothing wrong with that. If you want to make something unique choose one of these ideas. Random Acts of Kindness Advent Calendar free printable. The Waldorf family published some pictures of a lovely home sewn Advent Spiral.To simplify draw a large spiral on blue or purple card stock. Stick 24 self-adhesive stars along the spiral. Head over to Spell Outloud to find instructions for making a simple Advent chain. This link includes a free download for the chain links. Advent is the perfect time of year to collect money for a good cause. Brush thin white glue (mix with a little water) onto a clean glass jar and cover with tissue paper squares. Repeat until the entire jar is covered. Brush on another layer of glue and leave to dry. Tie a ribbon around the neck of the jar. Use the jar to collect money. At the end of Advent roll and count the money. Advent Conspiracy and Simplify the Holidays both promote a Christmas celebration focused on people rather than stuff. They have some great suggestions. This year I have teamed up with a friend to create another Advent offering. It is called Waiting on The Light and I am really excited about it. 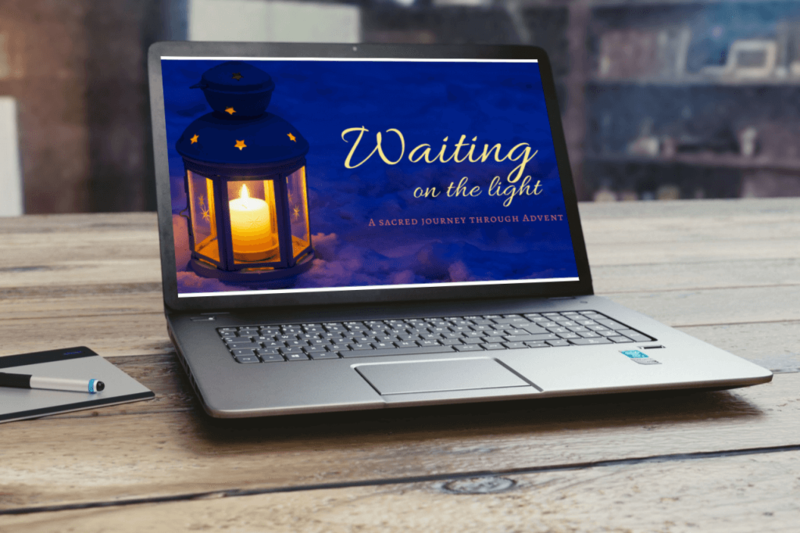 It is a daily Advent devotional delivered directly into your In box. The daily e-mails will include meditations, prayers, photographs, questions, daily actions, outreach projects, family activities, and videos!​ For more information click here. In 2014 I was privileged to co-author an Advent Devotional book for families. Each day explores an Advent-related word that begins with a successive letter of the alphabet. There is a short reading and suggestions for ll kinds of simple activities . It is available in as an e-book, so you can download it and start using it immediately. Do you celebrate Advent as a family? What special traditions do you have? Please share your ideas in the comments below. A friend has just wrapped up 24 books to read each night and I’m going to borrow that idea – kids will get a kick out of it I reckon! I’m going to be trying the book idea next year. I’ve always loved advent countdowns although i didn’t get around to organising one for this year! There are so many wonderful ideas around these days! I agree! I am in awe of people’s creativity! Thanks for stopping by to leave a comment. We do an activity based advent calendar to count down the days to Christmas that fosters togetherness and the giving that should be intrinsic to the season. Sarah from Creating Contentment recently posted…hello December! I love those activity based Advent calendars. They are a wonderful way to bring families together. I run a home daycare, so we’re doing an activities-based 24 day count-down (even on the weekends when they aren’t here) and then also doing 24 books and a 12 day “Waldorf advent spiral” with my daughter. Yesterday, we read a lovely Alfie book, painted our own aprons, and made shortbread! Great ideas there. We are using our elf to do an act of kindness each day, which so far has been lovely.